Lead Morale Global Chat: New Venue – Yes or No? by Kate Nasser | Comments Off on Lead Morale Global Chat: New Venue – Yes or No? Lead Morale global Chat on Twitter is Seeking a New Venue! 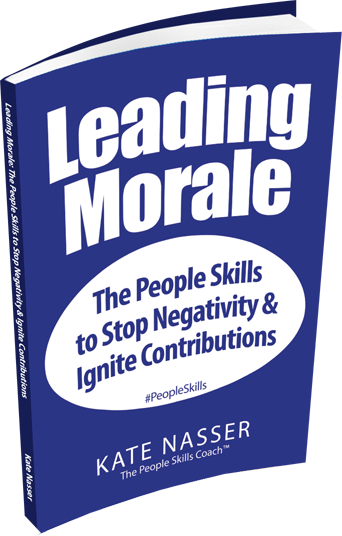 Host: Kate Nasser, The People Skills Coach™, Author of Leading Morale. WHEN: Stay Tuned for New Venue, Date, Time. NOTE: USA is now on Daylight Saving Time. For those who live in a country that does not participate in DST, the chat is one hour earlier than usual in your local time zone. Click here to convert time between time zones. Lead Morale Global Chat – New Venue? Lead Morale Global Chat News & Question! Lead morale global chat has been running on Twitter for the summer and early fall. We have done some wonderful topics and there are so many more to do. However, we haven’t yet found the right day/time that draws people in. We did Thurs 9pmET and then moved it to 8pmET. Yet feedback is still that the time slot doesn’t work for people. SO we are in the process of thinking through all this. Would you like to give feedback to help us find the right venue (Twitter or something else) and date/time? When you think of leading morale, do you want to engage in a live chat (e.g. like Twitter or some other venue) or take a webinar with how to’s? When would be the best day/time of day to do a regular online event about leading morale? Weekdays during the day? Weeknights? Pls. specify what time zone you are in when you leave your comment. What other thoughts do you have about this that would help us find the right venue/date/time? My gratitude to all who have contributed so far in Lead Morale Global Chat chat (#LeadMoraleChat) every Thurs. and also to those who participate in the people skills global Twitter chat (#PeopleSkills) every SUN. 10amET — now in its 6th year. Your insights, questions, and voices trend on Twitter each week with the power to make this a more civil world. Thank you. Continued thanks to generous chat moderators, guest hosts, and co-hosts including Jandis Price, Tom Rhodes, Manav Lalotra, and Andrea Sanchez for their insights, time, and generosity. Share your perspective about a new venue for Lead Morale global chat in the comments section below. Truly grateful for your insights! I am the founder and host of these two global Twitter chats and will be happy to answer any questions you have in advance: Email me or ping me on Twitter @KateNasser. Buy Kate Nasser’s new book Leading Morale.